Stockton Heat center Derek Grant opened the 2016 calendar year on quite as auspicious note. The 25-year old native of Abbotsford, B.C., tallied 10 goals and nine assists in 10 games to help lead Stockton to an 8-1-1-0 record during that span and a meteoric climb from seventh to fourth place in the American Hockey League’s (AHL) Pacific Division standings. The 19-point performance in 10 games earned Grant honors as the CCM/AHL Player of the Month for January. He ended the month by winning the CCM Fastest Skater event at the 2016 Toyota AHL All-Star Challenge in Syracuse, N.Y.
Grant was the Heat’s lone representative at the AHL All-Star Classic. Grant’s January scoring rampage pushed him to the No. 2 spot among AHL goal-scoring leaders with 21 goals in 28 games played. He ended the month ninth overall among the league’s point leaders with 36 points to lead the Heat in team scoring. Among his January highlights was a career-high four-goal performance in a 7-4 win at Iowa on Jan. 17. He scored both Stockton goals in a 2-1 overtime win over the Pacific Division-leading Ontario Reign on Jan. 27. Grant called the Player of the Month recognition an “honor.” He gave credit to his teammates for helping him receive the league-wide recognition. “Obviously, our record shows that we struggled for the most part of the year,” he said. “But in January, we came together as a group and we went on a pretty good run and climbed the standings. The 2016 Toyota AHL All-Star Classic took place Jan. 31 and Feb. 1. The event was divided into a skills competition (first day) and mini-game tournament challenge (second day). Grant was one of 13 players named to the Pacific Division All-Star Team. During the skills competition, he timed 14.307 seconds to win the CCM Fastest Skater event. He was one of five skaters to clock below 15 seconds in the event, edging Ontario Reign forward Sean Backman (14.468), Charlotte Checkers forward Derek Ryan (14.504), Utica Comets forward Hunter Shinkaruk (14.799) and Syracuse defenseman Matt Taormina (14.911). Grant’s victory in the fastest skater event helped the Western Conference All-Stars out-point the Eastern Conference All-Stars 19-14 to win the skills competition. The Western Conference All-Stars were comprised of players from the Pacific Division and Central Division all-star teams. Each conference all-star team collected points during the seven skills competition events. “It was a little surprising for me, I guess, but everyone was cold going into it, so you were just hoping you weren’t going to pull anything around when you were skating around, so it turned out all right,” Grant explained. Grant, whose 6-foot-3, 206-pound frame allows him to take long strides, said he has always taken pride in his speed work on the rink. Grant joined San Diego rookie left wing Nick Ritchie with two goals and one assist during the Pacific Division All-Star Team’s three mini-games during the 2016 Toyota All-Star Challenge. Instead of a traditional all-star game, the challenge portion of the weekend event consisted of each divisional all-star team competing in a nine-minute mini-game in a round-robin format. The two teams with the best records from the round-robin competition advanced to a six-minute, three-on-three championship game. The first half of each round-robin mini-game was played four-on-four and the second half played three-on-three. The Pacific Division all-stars finished 1-2 in their three round-robin games, defeating the Central Division all-stars but losing to the Atlantic and North division all-stars. The Central Division All-Star Team defeated the Atlantic Division All-Star Team, 4-0, in the championship mini-game as Chicago Wolves forward Pat Cannone scored three goals and Rockford IceHogs goaltender Michael Leighton posted the shutout victory. Cannone was named the MVP of the AHL All-Star Challenge. Ironically, the Pacific Division All-Star Team handed the champion Central Division All-Star Team its only loss in four mini-games. “That was kind of nice, as they ended up going on to win it … We were the only team to beat them, so it was a little moral victory for us,” Grant quipped. At the time of his selection to the Pacific Division All-Star Team, Grant, a fourth-round (119th overall) draft pick of the Ottawa Senators in the 2008 NHL Entry Draft, led Stockton with 15 goals and 21 points in 21 games. Grant is playing in his sixth season in the AHL. At the time of his Player of the Month award, he had appeared in 284 career AHL games with 153 points (82 goals, 71 assists). He played parts of five seasons with the AHL’s Binghamton Senators, winning a Calder Cup championship with them in 2011. Grant signed with the NHL Calgary Flames in July 2015. 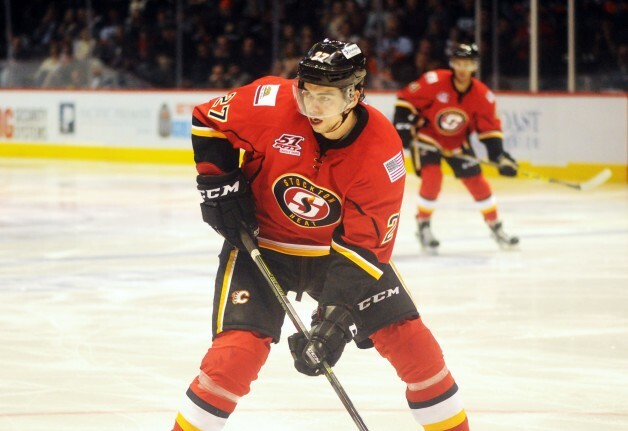 Stockton is the Flames’ AHL affiliate. He appeared in nine NHL games earlier this season with Calgary and has appeared in 34 career NHL contests with both Calgary and Ottawa during his career. Grant termed his first call-up to the Flames memorable, but maybe not for the reason one might immediately suspect. Grant said he felt “a little more confident each game” during his stint with Calgary. He said he is looking to get another shot at proving himself with the parent club. “Obviously, you come back down here and work on things to get back,” he said. “Things happen a little quicker up there and it’s easier to play. The plays are crisp and clean — everybody is in the right spot. You expect that because you’re playing with the best guys in the world. A lot of times they’re making your job easier. That isn’t to say that Grant’s AHL tenure hasn’t been exciting. He got the opportunity to make history when the AHL held its first outdoor game west of the Mississippi River on Dec. 19. The Heat hosted the Bakersfield Condors in a game at Raley Field in Sacramento. The contest attracted 9,357 fans to the AAA minor league baseball stadium. Stockton skated to a 3-2 Pacific Division win. Grant scored one goal in the Stockton victory. The temperature at the start of the game was 52 and dropped to the mid-40s by the end of the game. Grant said the move west has been positive. January’s success has carried over into February. Grant continues to lead the Heat with 23 goals and 38 points in 30 games. The 38 points match his single-season career best with Binghamton during the 2014-15 season when he tallied 21 goals and 17 assists in 73 games. A total of 10 players from the AHL’s five California teams were represented on the Pacific Division All-Star Team, including three from the Reign (goaltender Peter Budaj, defenseman Vincent LoVerde and Backman), two each from the Bakersfield Condors (defenseman Brad Hunt and goaltender Laurent Brossoit), San Diego Gulls (defenseman Brandon Montour and Ritchie) and the San Jose Barracuda (forwards Barclay Goodrow and Ryan Carpenter) and one from Stockton (Grant). Backman replaced Reign forward Michael Mersch, who was a late scratch. Hunt, who was making his third appearance as an AHL All-Star, won his heat in the Sher-Wood Puck Control Relays and came in second in the CCM Hardest Shot event after being clocked at 100.2 mph. Hunt, who began shooting the puck in his backyard as a youth, has proven to have one of the league’s hardest shots. He was clocked at 101.2 mph at the 2015 AHL All-Star Classic. Ryan Graves of Hartford won the hardest shot competition with a shot clocked at 103.4 mph. At the time of his all-star selection, Hunt (who has played 21 games with the parent club Edmonton Oilers) had collected 23 points (six goals, 17 assists) in 26 games. He currently ranks third on the Condors with 30 points (eight goals, 22 assists) in 35 games this season. Backman (one goal, two assists) and Hunt (three assists) joined Grant and Ritchie with three points to tie for the Pacific Division All-Star Team scoring lead. Brendan Ranford of the Texas Stars collected a pair of assists for the Pacific Division all-stars, while Montour and San Antonio Rampage’s Mikko Rantanen each scored one goal. Goodrow and Carpenter and Texas’ Esa Lindell each were credited with one assist. Budaj appeared in three mini-games while Bakersfield’s Brossoit appeared in two mini-games. Budaj entered the AHL All-Star Classic with a league-leading 17-7-2 record, 1.69 goal-against average and .930 save percentage. Ritchie was clocked at 99.2 mph in the hardest shot skills competition event. “It was a great experience and it was something that I’ve wanted to do and got a chance to do, but I’m excited to be back in San Diego,” said Ritchie, the Gulls’ second-leading scorer with 28 points (15 goals, 13 assists) in 33 games. The San Diego rookie forward said he enjoyed both the skills competition and the mini-game tournament. “They were both pretty fun, I think that in the game you got to move around a little more, and play a little more, (so) I think the game is a little more fun for the players,” he said. The 2016 All-Star Classic rosters featured 38 first-time AHL All-Stars, nine rookies and 10 former first-round draft choices, including San Diego’s Ritchie. Also, 23 of the All-Stars named had already appeared in NHL games this season. Both the Central Division and Atlantic Division all-stars finished 2-1-0 in round-robin to advance to the championship game. Cannone recorded three goals and one assist in four games on the night while Grand Rapids Griffins defenseman Xavier Ouellet collected two goals and two assists and T.J. Tynan of the Lake Erie Monsters collected five assists to pace the Central Division all-stars in scoring. Leighton led all goaltenders with a .929 save percentage in his two appearances. Manitoba Moose rookie goaltender Eric Comrie, a graduate of the L.A. Selects/L.A. Jr. Kings program, represented the Central Division All-Star Team at this year’s AHL All-Star Classic. He stopped 17 of 19 shots in three skills competition events to earn the CCM Top Goaltender award for the victorious Western Conference All-Star Team. A 1995 birth year, Comrie was born in Edmonton, but moved to Newport Beach with his family when he was 9. He stopped nine of 10 shots in the AHL Rapid Fire event, turned aside all three shots he faced in the U.S. Army Pass and Score event and blocked five of six shots in the Panasonic Breakaway Relay event. In 19 games with the Selects 16U team in 2010-11, Comrie posted a .940 save percentage and 1.34 GAA. He was taken in the first round (13th overall) of the Western Hockey League 2010 Bantam Draft by the Tri-City Americans and later signed a three-year entry contract with the Winnipeg Jets after being tabbed in the second round of the 2013 NHL Entry Draft. Comrie represented Canada at the 2015 IIHF World Junior ockey Championship where he appeared in two games, winning both with a 1.50 GAA, and led Team Canada to the gold medal. Comrie, 20, has appeared in 36 games this season for the Moose with a 10-19-7 record, 3.12 GAA and .907 save percentage. Veteran San Jose Barracuda coach Roy Sommer became the AHL’s winningest all-time head coach in the 80-year history of the league when his team topped the visiting Ontario Reign, 4-2, on Feb. 10. The win gave Sommer a new AHL record 637 victories to surpass the previous 72-year-old record of 636 wins held by Fred “Bun” Cook, who coached 19 seasons from 1937-56. Cook broke the exiting AHL career coaching record in 1943. His record had stood 60 years since his retirement. Sommer, 58, is in his 18th season in the AHL, a span spent entirely with the San Jose Sharks organization. He has coached in 1,388 games – also a league record. An Oakland native, Sommer has coached 120 players who have gone on to play in the NHL. Chicago head coach John Anderson is the next winningest active head coach with 413 career AHL victories.